A fully equipped property with an eclectic decor and style and fine furniture ready to fulfill any whim of its guests. 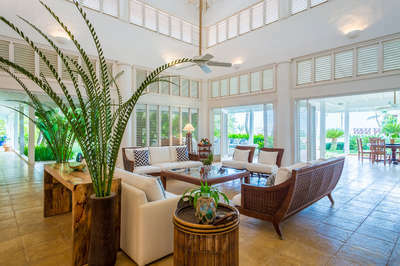 The villa reflects the Caribbean spirit compared to a five stars hotel. The master bedroom has an enormous king bed, a spacious bathroom and an escritoire which overlooks the pristine waters. Then, the other two bedrooms have one king-sized bed each and their private bathrooms. A fourth bedroom has another king-sized bed, the fifth bedroom has two charming double beds and the last bedroom, ideal for toddlers, has two full sized beds. They are all en suite and equally equipped with their own flat screen TV, cable, DVD, their own private bathroom, toilet, shower and walk-in closets. The villa's common spaces are an abundant exhibition of superb taste and details. Hammocks are everywhere (thus the villa's name) and the infinity pool is ready to receive the splashy guests. Inquire about a discounted weekly rate. Cook services (three meals per day and snacks if required). Cost of food and beverages. 8.4 km to Eden Roc Beach Club. 7.6 km to Eden Roc Hotel. 11.3 km to the airport. 3.3 km to Api Beach and the marina. 9.1 km to Punta Espada Golf Course. 11.6 km to the supermarket. 8.7 km to Golden Bear Tennis. The villa was absolutely beautiful - even batter than pictured. The staff were all amazing and the food was delicious at every meal. Our group of six enjoyed every aspect and amenity provided at Villa Las Hamacas.